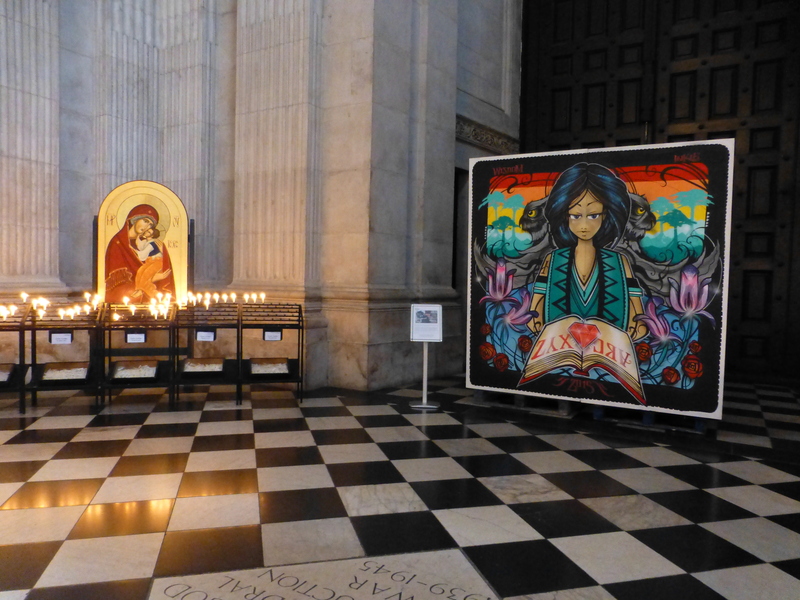 Over the course of Friday and Saturday an incredible and rather unique Street Art event took place in none other than St Paul’s Cathedral, featuring three artists as a part of the History, Art & Hidden Treasures project being held over the summer. 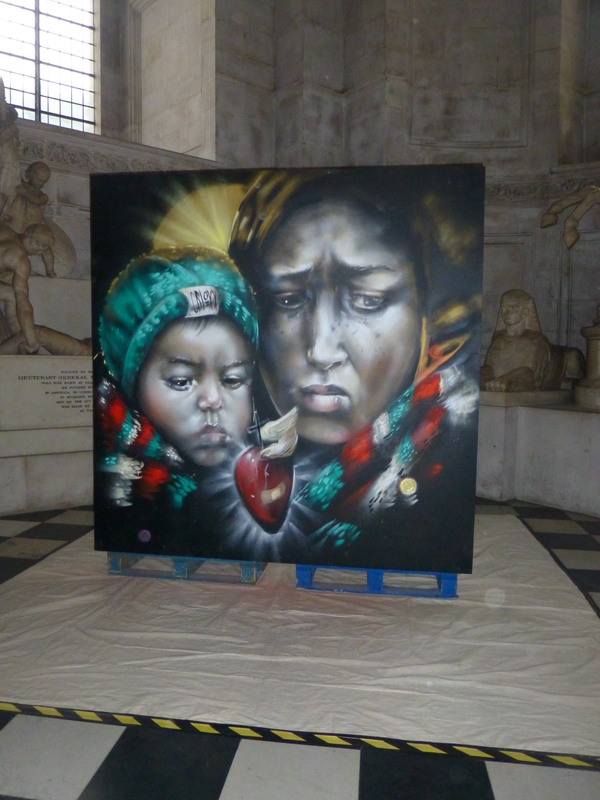 The event was conceived and implemented superbly by Donna McDowell, who is the Head of Schools and Family Events, and for this project wished to bring a form of artistic expression very far removed from such a setting and have it created and displayed alongside the many art pieces and styles displayed in the cathedral. The works all had a theme chosen by Donna, who offered up the idea for each piece and allowed the artists to create their works in their own style using the idea as the inspiration for the subject. What was great was how all three artists created works fitting the chosen subject but very much in their own unique and distinct style. 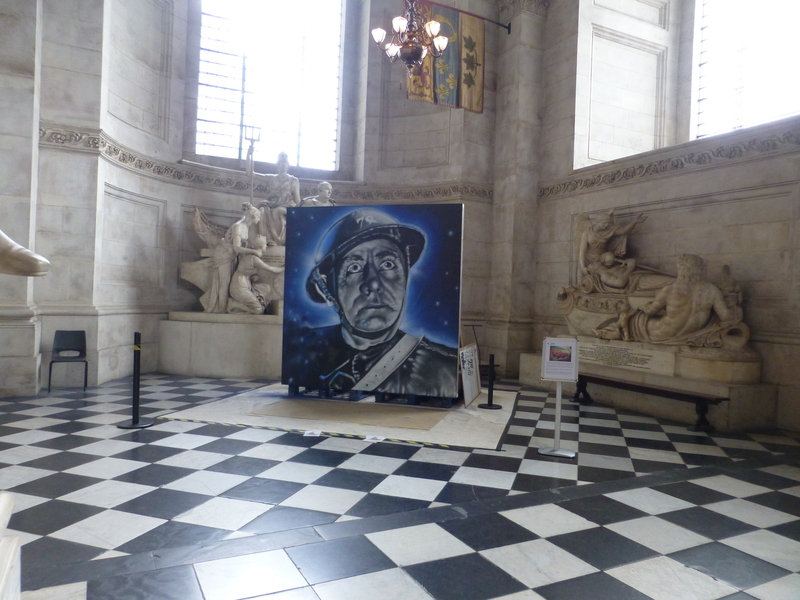 St. Paul’s Cathedral, one of London’s premier tourist attractions, certainly made for an exemplary change of pace for a place to see Street Art made and displayed – not making for somewhere we ever expected to see spray paint be used! Unfortunately we were unable to attend all of the event, but thankfully made it in time to see the final stages of the final day. 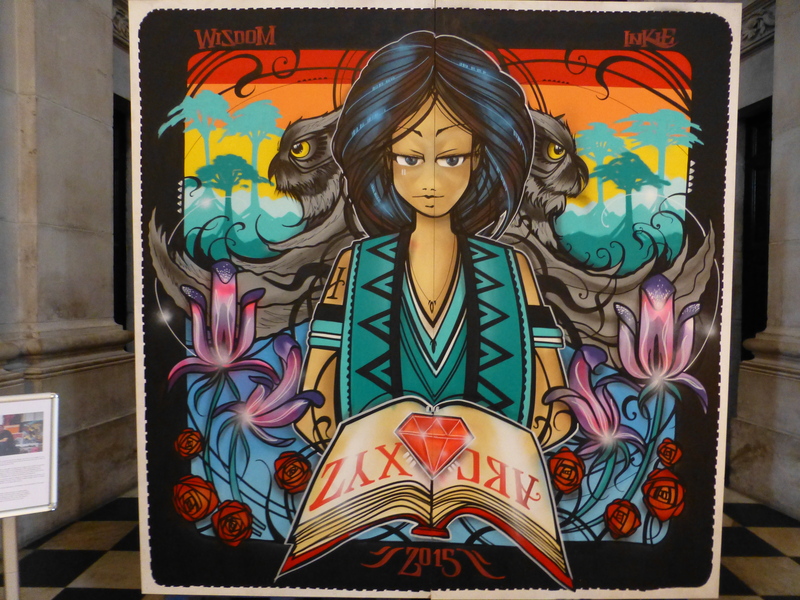 Work by Inkie, whose piece was inspired by the lack of representation of women in art traditionally seen adorning religious institutes – this cathedral included! 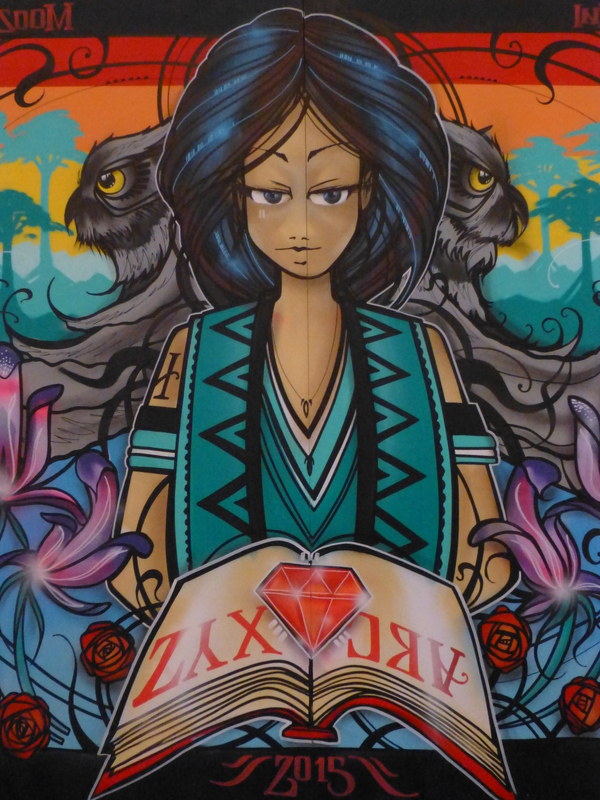 In the Book of Proverbs, “woman” is described and personified from “wisdom” and this was Inkie’s theme, from which he took these passages from the Book of Proverbs and incorporated the subject setting it alongside his distinctive style of character work. 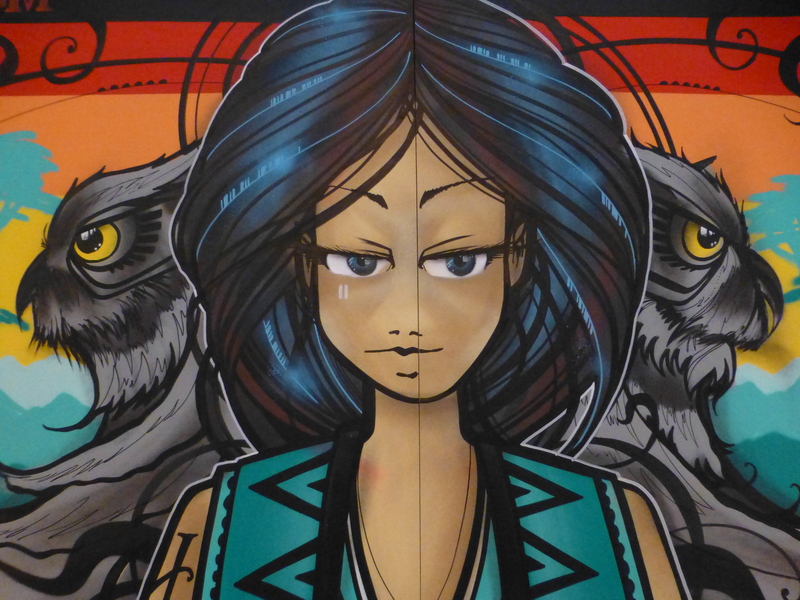 The vibrant work features a dominant female figure as the centre piece set amid two owls – a creature which is often portrayed as being wise, and she is presenting a book, a prevailing form of sharing knowledge. Upon the book rests a ruby which pertains to a passage in the Bible referring to how a virtuous woman is worth more than rubies. 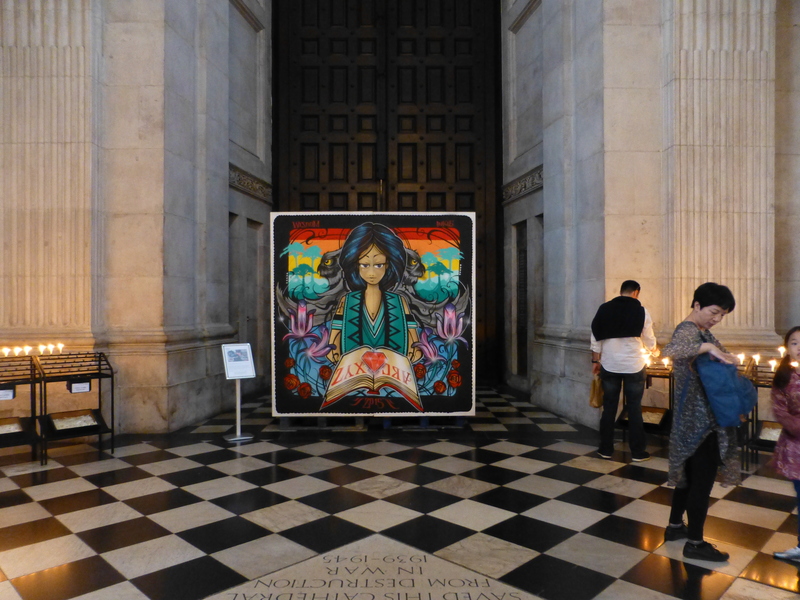 If you look closely to the highlights in the hair, you can see binary coding, drawing a link through the transmission or notions of wisdom and knowledge from such long-standing mediums as the book to the modern equivalent of binary in the Digital Age. 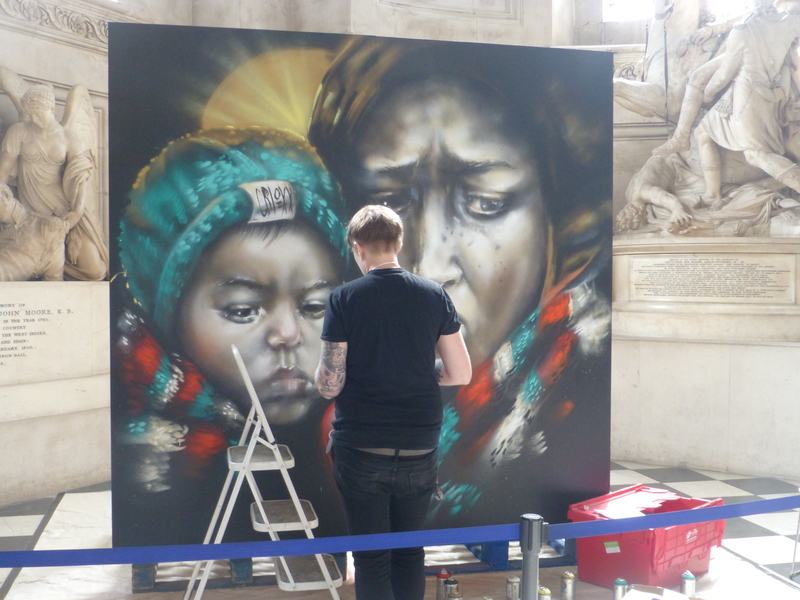 CBloxx working on the final stages of her superb piece. 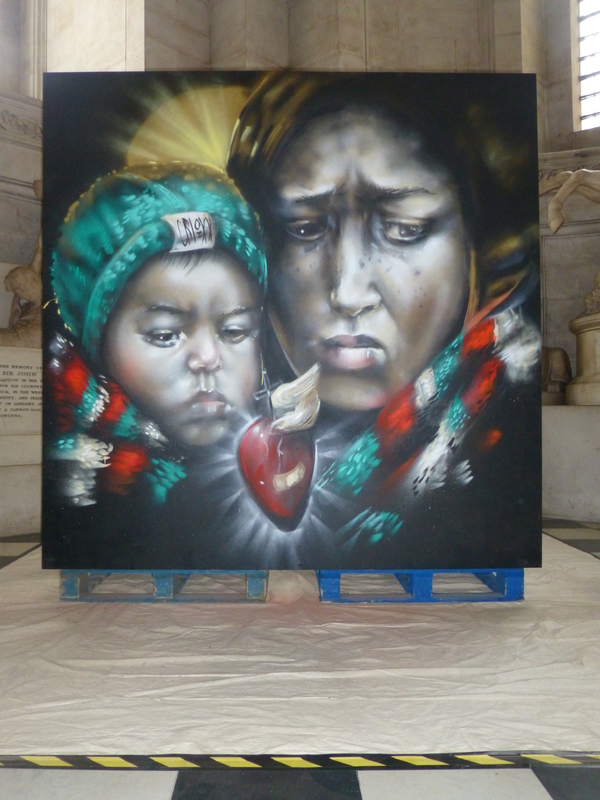 Standout Work by CBloxx, whose theme for the work was based on a passage of the Bible that describes Mary & Jesus as refugees fleeing Egypt. 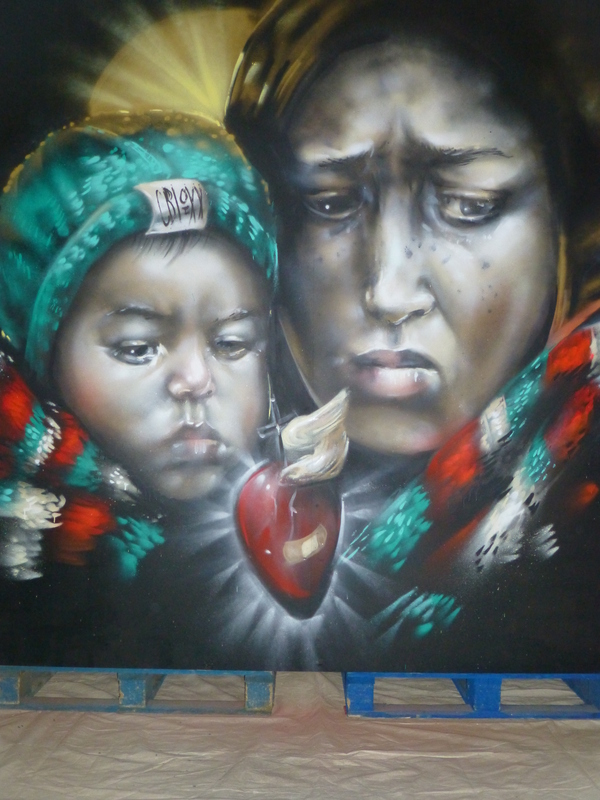 So the subject was that of Mother & Child fleeing, a theme which is reflected in the exceptionally brilliant and sullen themed piece from CBloxx. 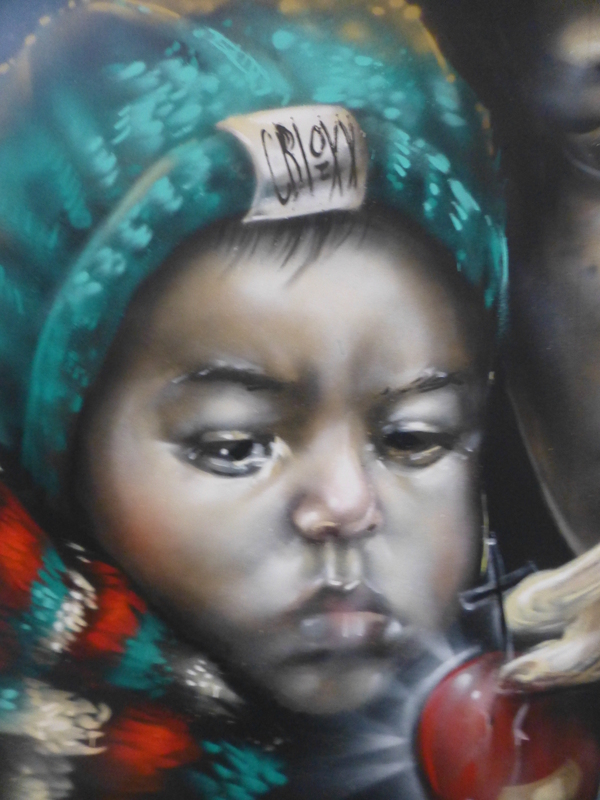 For the colours of the scarf and hat on the child CBloxx took colours from the flags of modern nations in the Middle East currently involved in civil wars and international conflicts and spawning refugee exoduses in their wake. 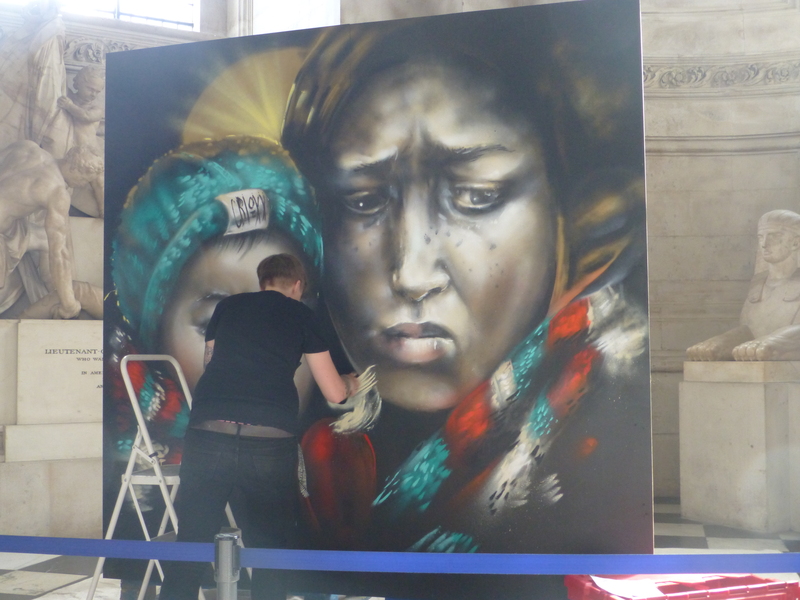 The bright colours in the hat and scarfs contrasting nicely with the dark nature of the subjects. 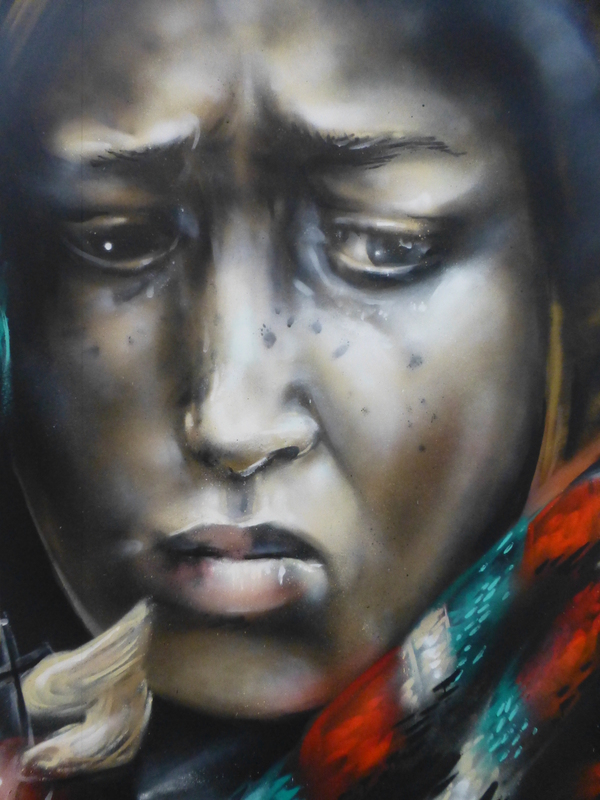 This work is just so striking and powerful, you just become absorbed by the expressions in this image. 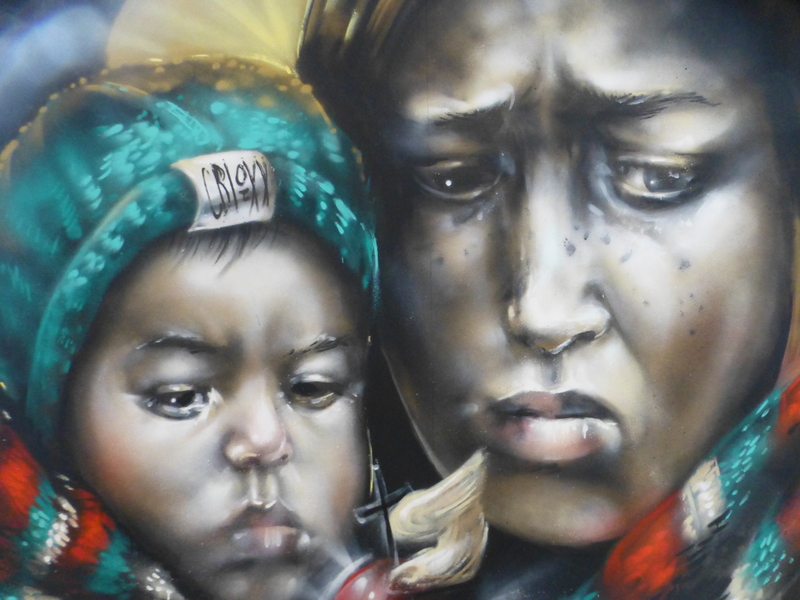 The tone of the pieces and the subjects, mother especially, creates an impression of extreme burden, a real fight for existence and hopefully a better life. Accompanying this, is that sense of unbreakable determination to persevere for the child, to push on and endure, no matter what. This isn’t a painting just of a victim, but that of a survivor. 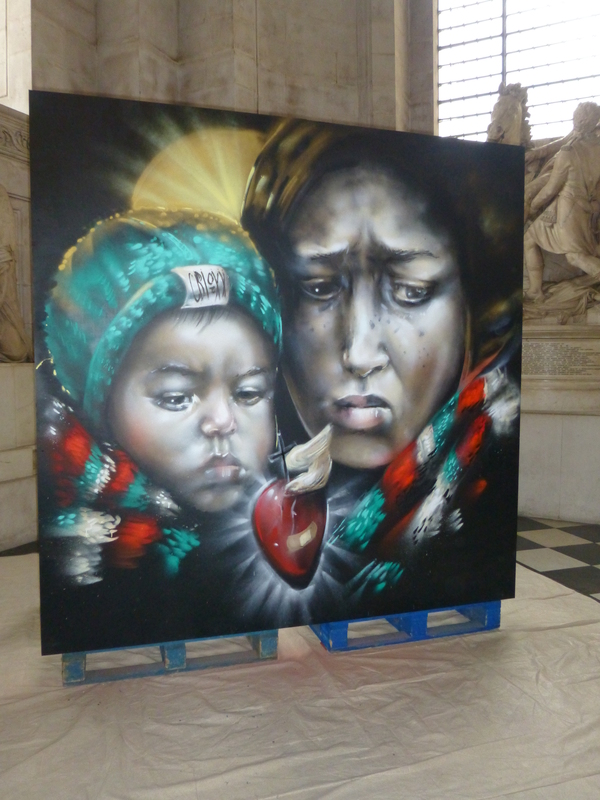 CBloxx is one of our absolute favourite artists, along with her usual painting companion Aylo, here at London Calling, but she really outdid herself with this one, we do wish we had been able to witness more of its creation, but are delighted to have seen it completed at least, just wow, powerful stuff. 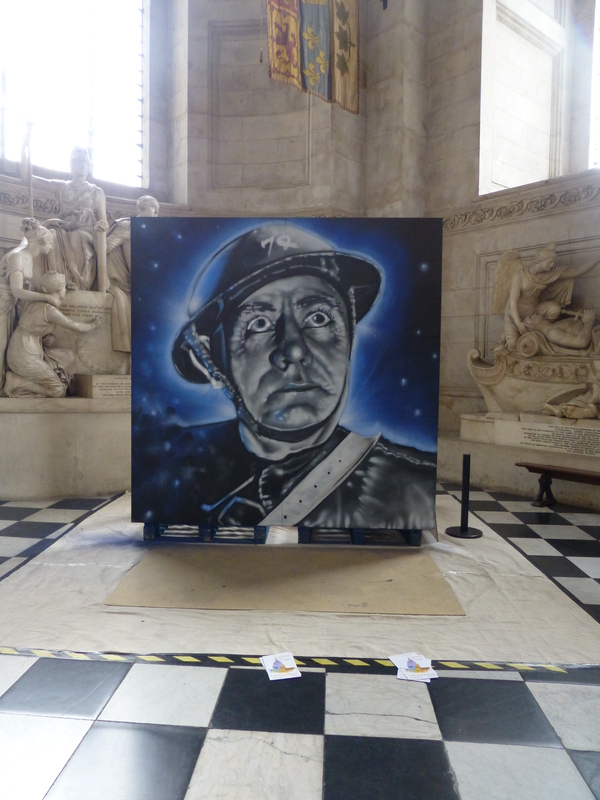 Work by Robert Jeffs, who is an employee at the Cathedral by day and Graffiti Writer in his spare time. What is most impressive about this painting is that it is Robert Jeff’s first major foray in to character work – and what an incredible job he has done. 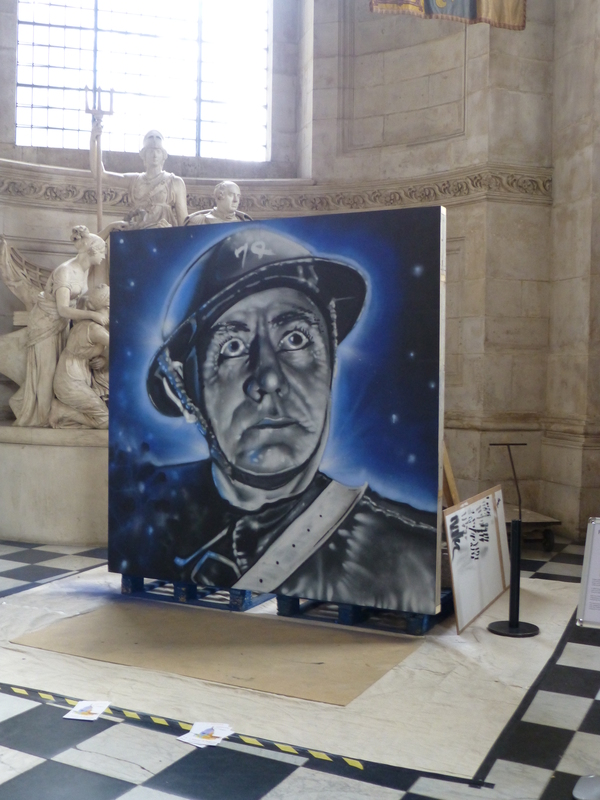 The focus of this work is a subject close to the heart of St Paul’s modern history, taking us to the Second World War during the Blitz; featuring a depiction of a member of the Civil Defence Unit the Fire Guard, also known as the Fire Watch. The Fire Watch in the Second World War was responsible for as the name suggest, watching for fires from bombing raids, to help call in support, aid those immediately affected and to put out fires. It was this Auxiliary Defence Unit that helped put out fires, such as that which hit St Paul’s Cathedral during a raid on December 29th 1940, a bombing raid that produced perhaps the most iconic image of London during the Blitz, that famous photo of St. Paul’s Cathedral, visibly unscathed, surrounded by fire, smoke and destruction, providing at the time a symbol of how no matter what London would survive the Blitz. 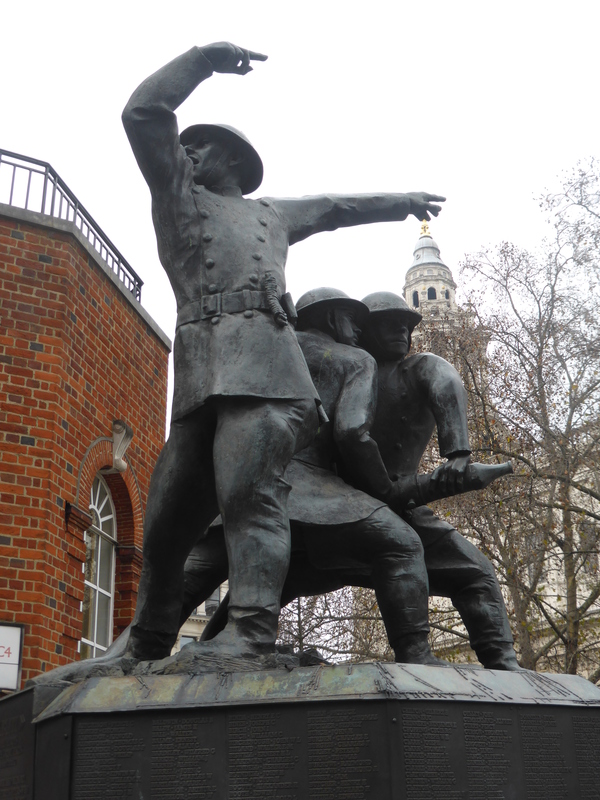 It is for this reason that the National Firefighters Memorial is situated opposite St Paul’s Cathedral and is comprised of three bronze statues depicting firefighters in action at the height of the Blitz. 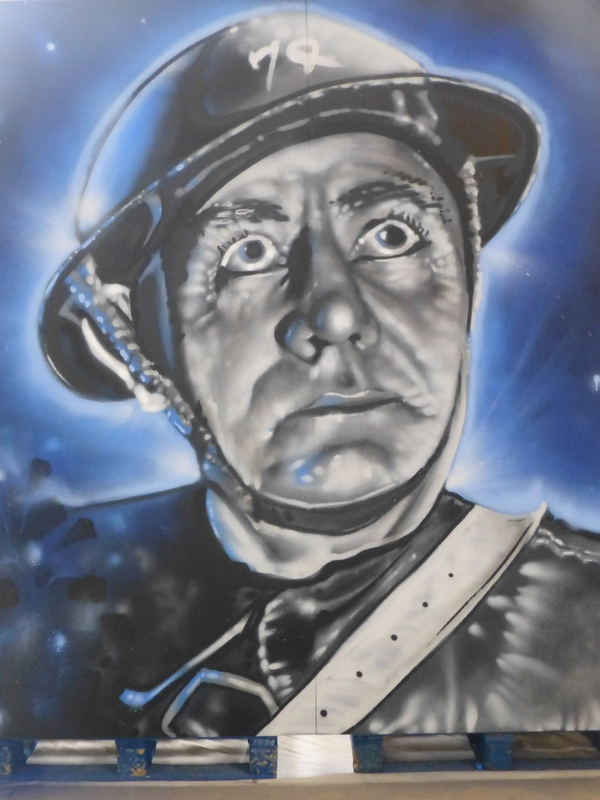 For this work we love the real old-fashioned typically British face depicted, the face of someone who lived during the Blitz, the grey-scale portrait really denotes a strong sense of determination, stiff upper lip even, which is really nicely juxtaposed to the tranquil black and blue night sky. The work doesn’t feature a look of terror during an expected red fiery sky theme, but takes the look of someone waiting, ready to take action when the moment arose, before the storm. 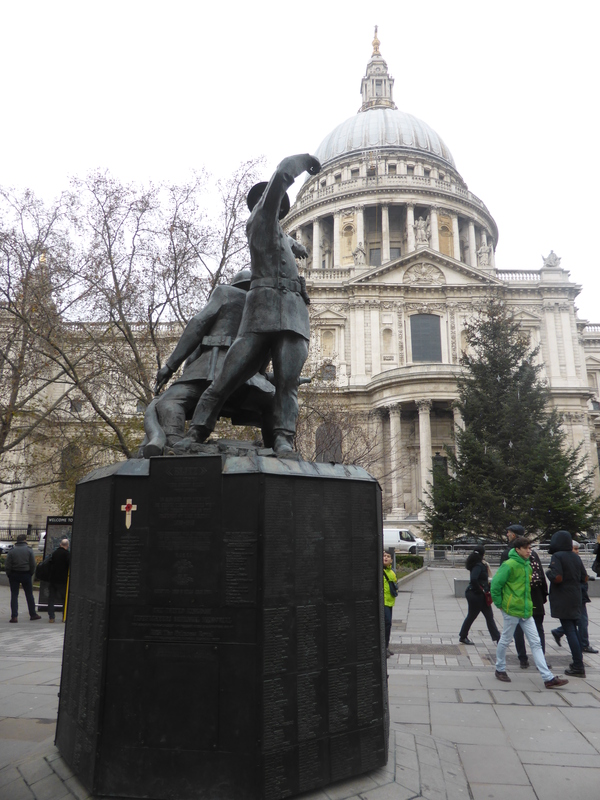 The National Firefighters Memorial opposite St Paul’s Cathedral. All in all an excellent trio of works that each embraced the subject matter proposed to the artist and all without fail executed in superb style works that were distinctly their own work. All set to a incredible background, what a location and certainly the most unique and beautiful place in which we have seen Street Art created or displayed. 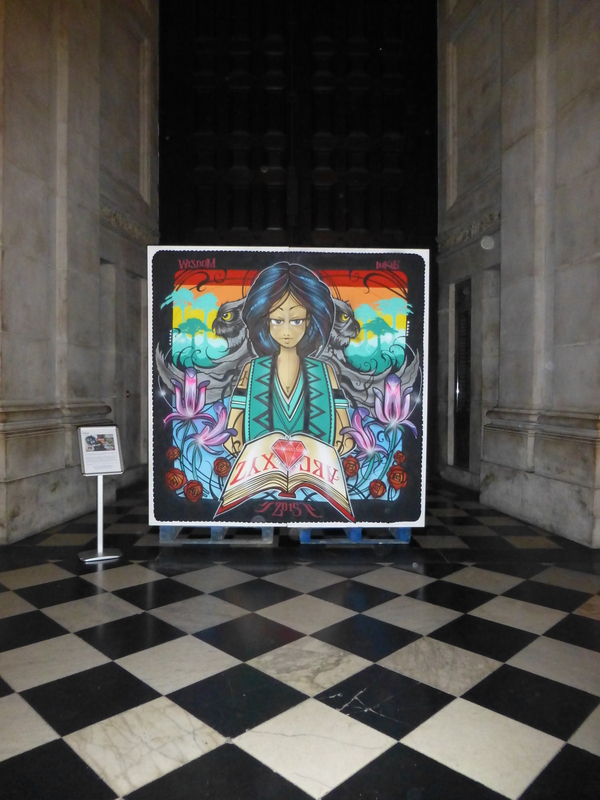 The pieces will be on display through the rest of the summer. 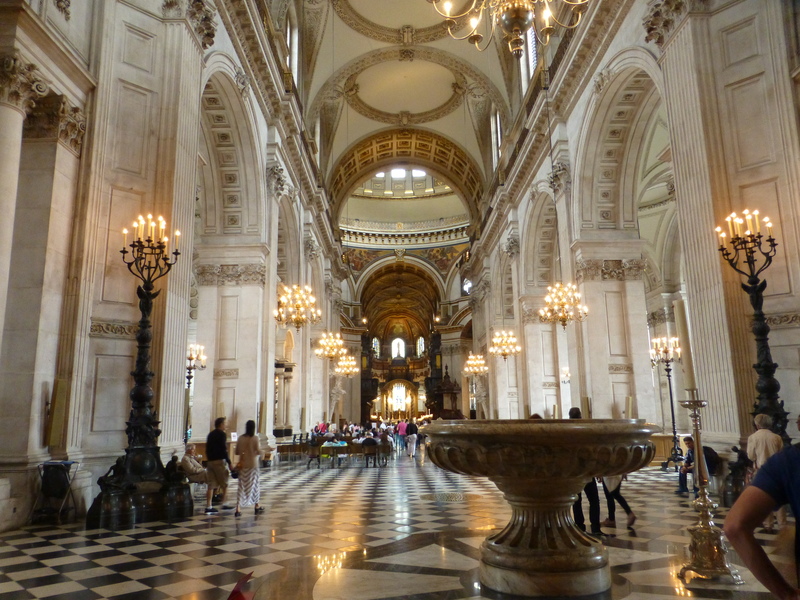 There are many great reasons to visit St Paul’s Cathedral, but for now, there is also one more! We would also like to say thank you to Donna McDowell for taking the time to explain to us the ideas behind the project as a whole and of each of the magnificent three works.